Turkey has renamed the street on which the new US embassy will be located after the American black Muslim civil rights campaigner Malcolm X. The embassy is still being built in the Cukurambar district in Ankara on what was formerly called 1478 street. Construction contractors BL Harbert have said the new complex is expected to be finished by 2020. 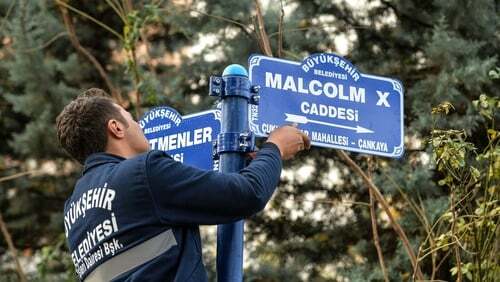 The renaming comes after the Ankara city council decision last month to change the name to Malcolm X Street. Turkish President Recep Tayyip Erdogan promised the late campaigner's daughters that the name of Malcolm X would "live on" in the Turkish capital. Municipality workers changed the signs of the street this morning, an AFP correspondent said, as frenetic activity continued on the site. Malcolm X, one of the most influential African Americans in history, was an outspoken Muslim advocate of the rights of black people and remains a hero today to many. Turkey has made similar changes to streets on which embassies are located in a bid to make a political point against a country. When Washington expressed concern over Turkey's offensive in northern Syria against a US-backed Kurdish militia, Ankara in February renamed the road Olive Branch (Zeytin Dali in Turkish) on which the current US embassy is located after the name of the offensive. In January, following a spat with the United Arab Emirates over the Ottoman Empire's actions in Medina, Ankara renamed the street where the UAE embassy is after the Ottoman governor of the time. Tempers flared after UAE Foreign Minister Sheikh Abdullah bin Zayed al-Nahyan retweeted a post on Twitter critical of the former Ottoman rulers of the region.